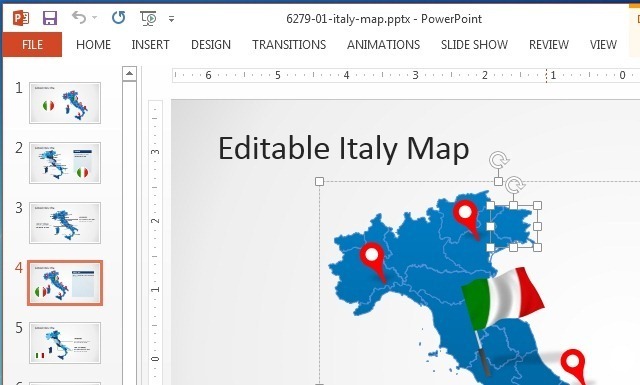 Want an editable PowerPoint map to make a presentation about your country? Or are you looking for a specific map template that can help you present your slides with attractive graphics and customizable maps? 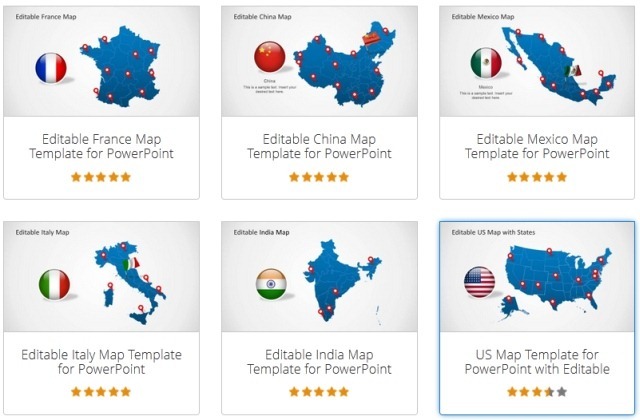 SlideModel offers map templates for dozens of countries. 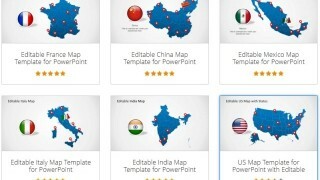 In fact, you can browse through our catalogue of PowerPoint Map Templates to find an editable map for your country. 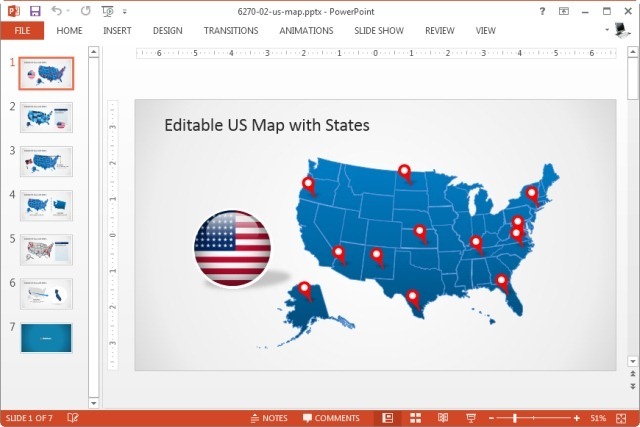 This is a PowerPoint map template that offers a complete map of the United States. The map can be edited to add, remove or customize the look of each state. 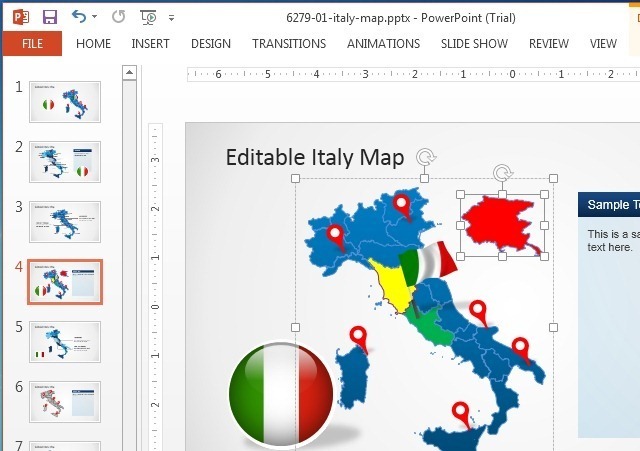 Just select any state from the map and customize it using PowerPoint (e.g. by using PowerPoint Drawing Tools). 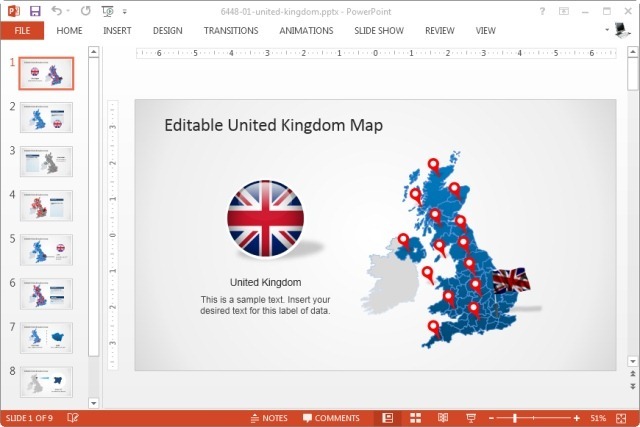 This UK map template presents different regions of UK in the form of an editable map. You can highlight individual counties and regions important to your presentation. You can do so by customizing the main map and by highlighting individual areas which are available in editable format. China has become an important business hub. Whether you are running a medium or large scale enterprise, doing a job for a reputable corporation or are working as a freelancer, the chances are that you will be dealing with equipment, contractors or experts from China. 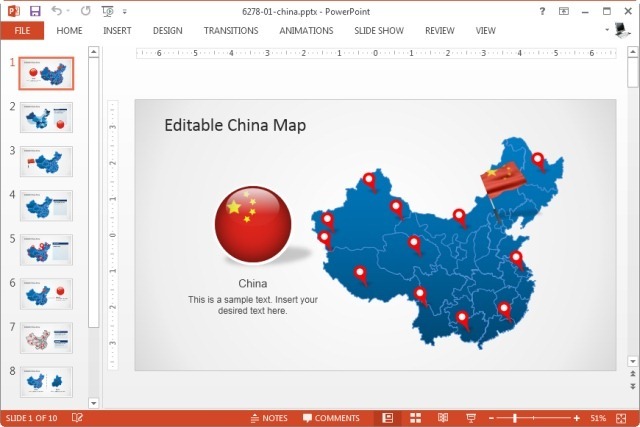 This is why having a template which provides a complete, editable map for China and all its major reasons can be quite handy in making presentations for official use. Doing business overseas has become quite easy due to improved global communication networks and one of the business hubs and world’s largest consumer base lies in India. Many businesses are contracting out parts of their business operations to India while other companies are looking to sell their goods and services to break into the Indian market. When projecting statistics for the potential to explore these options, its best that you know which area might be most relevant for your enterprise. 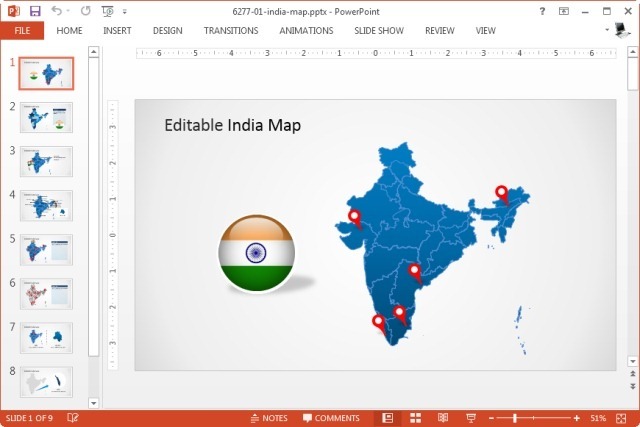 This template offers an editable map for India with the option to customize each state to create a comprehensive business plan. Of course, you can also use this and our other map templates for academic presentations and for making diagrams with relevant maps for personal use. SlideModel’s map templates can be comprehensively edited to customize the look of sample slides to your liking. 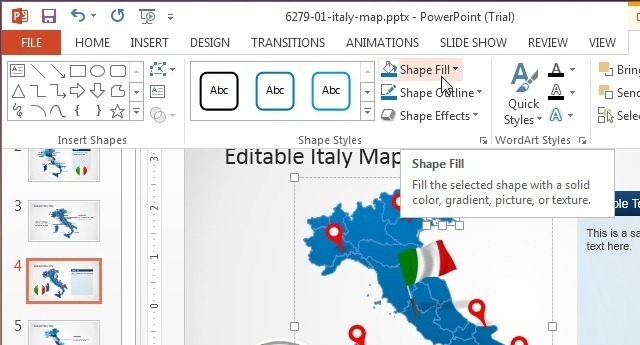 You can change the shape, size, color, shadow and other aspects of each slide by simply selecting an object and using relevant PowerPoint options. Step 1: Select an object within the map template. Our PowerPoint map templates are quite neatly crafted and you can even select important areas like provinces, states and administrative regions from them. These are sub-maps for important regions that can be highlighted, removed or dragged out from the main map. Step 2: Select an option from the PowerPoint Ribbon menu or right-click the object. Step 3: Recolor, resize and adjust the look of the object as per your requirement. Browse through our vast collection of map templates and Download an Editable PowerPoint Map for Your Country. Tags: Business Plan Template, Business PowerPoint Templates, Business Presentations, Map Templates, Maps, Sales, Templates.